Emerald: NURTW clash in Surulere...AGAIN??! 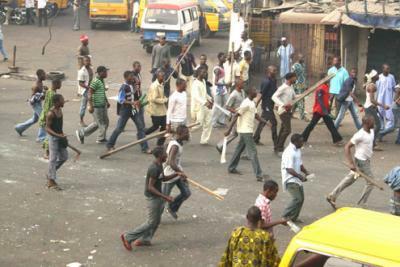 About 2/3 weeks ago,the Lagos Island NURTW chapter clashed, now the Surulere chapter are fighting for dominance. According to some sources, about 20 people are feared dead but the police are saying only 3 people were injured and no fatalities. If you ever doubted that there is money in NURTW, doubt no more! why else will people be fighting and killing themselves if not for money dominance.